Yes, for an extra $50, you could add the relays to that harness and leave the OEM wiring intact. There would be a bit more total wiring under the hood going this route, but otherwise shouldn't be a problem. It all depends on how much you want to spend. On the other hand, purchasing the harness would let you wire everything up off the car - not sure if that would make things easier or more difficult. I remember that a few of the Regal people had trouble with the light on the dash staying lit up after they turned the brights off. Did you have any problem with this? Also, the harness I linked to has two relays on it. Is that just to increase the voltage or to allow you to run both the highs and lows at the same time? The objectives of my modification vs. the SUVLights harness are different. I don't think the SUVLights harness lets both high/low lamps run at the same time. The relays in the SUVLights harness work as buffers, enabling the higher wattage bulbs to be controlled by the OEM lighting circuits. The OEM circuits activate the relays, which activate the high wattage bulbs in the harness. It preserves the OEM configuration. My modification uses the relays in a different manner, using the OEM bright circuits to control the OEM low beam circuits. It's a totally different schematic design. Since the stock wiring is used, mine isn't beefed up for higher wattage bulbs, although I've had no problems running 80W bulbs for the brights. I don't have the problems with delayed interior lighting like you mentioned. Any concerns the LCM can't handle running both high & low sets at once should be offset by the fact that one set is driven right off the battery, not directly by the LCM. I also got in the habit of pulling back my stalk to keep both high and low beams functioning on my old Ford Explorer. I did this for a couple of years, typically while visiting my buddy who lives out where there are no street lights, paved roads, and mostly dark forest. I rarely used this technique on the highway, but occasionally during bad weather night driving. Never bothered with a mod because I just held it back for both beams. The thing is, a couple of years into this, I was at my buddy's place after having driven there at night using the dual beam trick... And a few hours later while leaving, I hit the light switch and found it melted in the off position. That component just wasn't engineered to handle the power load for an extended period. In retrospect, I'm surprised the switch lasted as long as it did. Great write-up. I wonder why someone gave you a "-"
Good point, and although our lighting system may be different than the vehicle in your experience, the stalk is expensive and not something you want to replace if you don't have to. The great thing about using the relays is it takes load off the switch, so you won't be needing to hold the stalk "on" any more. The switch contacts shouldn't be at risk of melting or other malfunction. I'll assume your relays will cover everything. Glad it worked for you, Steve. I'm not sure what you mean about the schematic and pictures not matching. The pictures I took when doing what's shown in the schematic. Hmm. I didn't intend for the schematic to show the literal pin locations. The top and bottom relays are mirrored. Maybe that threw you off? Glad you got it to work. I've really been enjoying this mod, and happy to report no problems yet! humm im thinking of running a relay off from the right side low beam and bypass the L side low beam when the low beam comes on it wil energize a direct hot that will splice to both ballast. how could i wire this up with my current configuration ???? I need to see the diagram for the entire lighting circuit, and I need to have some idea of what loads the LCM is expecting. 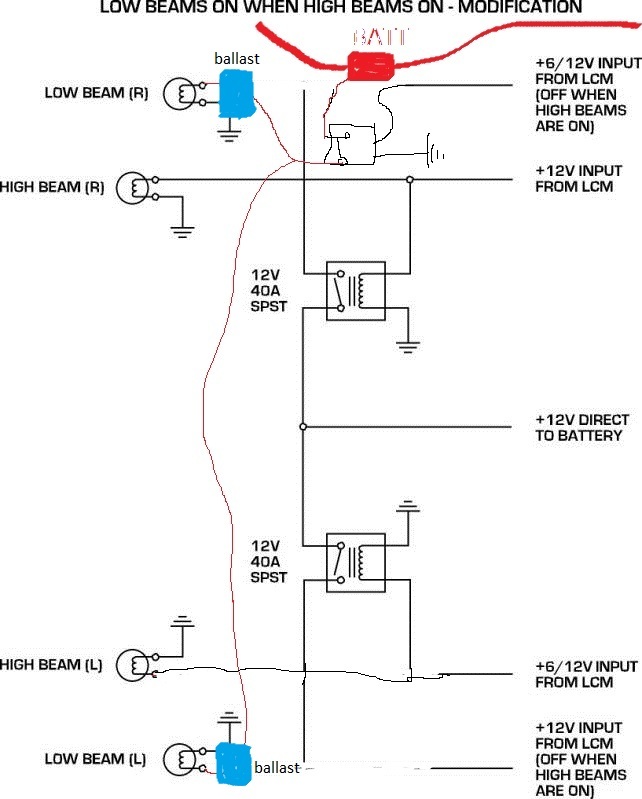 Thinking out loud... All you should need to do to turn the lo beams on when the hi beams are on is run a wire from the circuit that switches the hi beam relay, through a diode, to the lo beam relay switching circuit. I AM NOT SAYING GO DO THAT... again, I am just thinking out loud and we really need the diagram for the entire lighting circuit, and we need to have some idea of what loads the LCM is expecting so we can wire in substitute loads if needed. But that is what I am thinking. Another alternative is to rewire the headlights so the LCM does not control them anymore. You could still use headlight switch for switching, taking your signals off its input side that had fed the LCM through appropriate diodes. You'd leave the LCM in place, just not use the headlight outputs from it that currently feed the relevant relays - substitute your switching scheme to control those relays instead. Again - just thinking out loud. im thinking of running a relay off from the right side low beam and bypass the L side low beam when the low beam comes on it wil energize a direct hot that will splice to both ballast. how could i wire this up with my current configuration ???? Trying to figure out what this will accomplish. It sounds like you want to use voltage from the R side low beam to energize a relay that turns on both HID ballasts? How do your HID lamps turn on right now? yes, i am thinking about wiring it so it uses jsut the right side to power a relay to power both HID ballast. Right now they are running off the factory wiring with a 20A fuse and i cut the plug off and made a direct ground with 14 Ga wire very short for a good connection. Not sure if its the car starting with the lights comming on at the same time causeing all the ballast to burn up or what. So i am thinking just making my own circuit and run it off the light switch if possiable. IF i remember i can use a 3rd prong that has nothing to do with the DRL or auto lights, use that as a "remote" start wire for the relays up front, and fuses esc.. for overload protection. The overall product i want is the parking lights to work normallly as they do now, but to have total control over the headlamps brights and dims on a manually operated switch only. All you would have to do is splice a wire coming out of the positive side of your brights into the relay switch, and have that power the low beams. As Albert figured, you'll need a heavy-duty diode to make sure you don't send 20A upstream when you splice the relay power into the positive side of the low beams. Keep in mind a diode will drop the voltage 1.6v on the circuit it's installed. If you splice a diode into your low beams, they receive 1.6v less than they were designed for (they will not be as bright). So the diode idea works for HID since you won't need the lows, but it doesn't work for the purpose of the write-up (lows + brights on at same time). You are right about the diode voltage drop, but it's not the intent to put the diode in series with the lights. The lights get 12v switched by the diode, not powered thru the diode. (also, in wiring the lights use 14 Ga. or thicker wire to avoid voltage drop). The diode's voltage drop should only be seen by the relay - the universal type "heavy duty" relay used for this kind of application (the ubiquitous Bosch 033220915*) switches with around 9V thru its coil IIRC. Continuing to think out loud: the point of the relay scheme is just providing an alternate way to switch the lights on, in parallel to the existing switch/relay scheme. I'd still need the schematic for the existing electricals and details on the existing LIM to be any more help here. Glad to find this thread as I was wondering about this same Hi/Lo combo lighting just the other day when I was watching how the headlights lit in its reflection off of the front bumper of a truck in front of me. I wish the 95 just had DRL. In NC, it is the law that headlights must be on if the windshield wipers are on. DRLs or the ability to have the wipers trigger the lights would automate that function. This solution for running the Hi/Lo beams in conjuction by switching off of one set may provide some ideas in that direction as well. AA, still no problems with wires, switches or housings meltiing with both beams on at the same time? Everything's still working just fine. I just returned from a 200 mile drip through northern OH after during the night hours, had the brights on more than half the drive. Disclaimer: per the mention on the first page, my auto lighting control was toast before I did this mod. So I manually turn on the headlamps at night, have done this for a few years. DRLs still come on during the day automatically. Because of this, I have no way to verify if my set-up is safe to use with a working auto lighting control, although I have no reason to believe it would hurt it. I do know it doesn't interfere with the auto DRL function. I wish to thank the member for giving me the advice to levee the dim lights on when i put the bright light on. I had my light installer follow your directions . I am now able to drive at night and see where i am going. You're right. I hadn't seen that thread. Merged the two together so it's all in one thread. Thanks!